Greetings everyone! 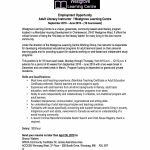 Westgrove Learning Centre is currently looking for an Adult Literacy Instructor for September 2018 – June 2019. Please review the attached posting. Application deadline is April 30, 2018.